What's Killing the Baby Sea Lions? Environmentalists say the overfishing of sardines — the main food source for sea lion mothers — is to blame. Fishermen say that's a crock. 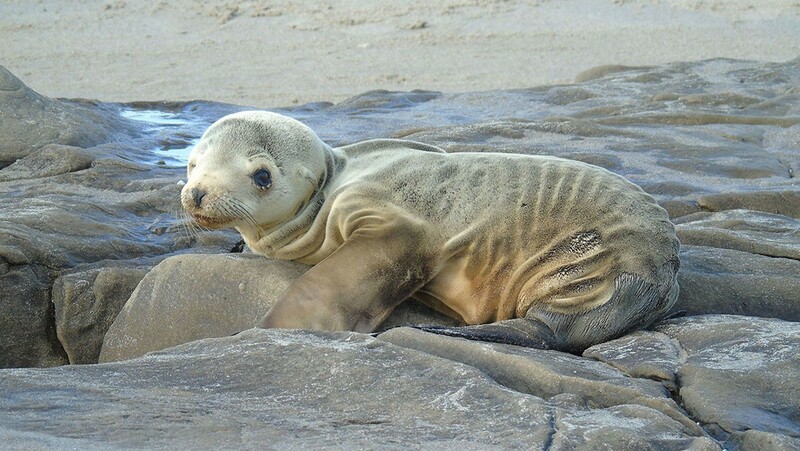 Baby sea lions are starving in record numbers. 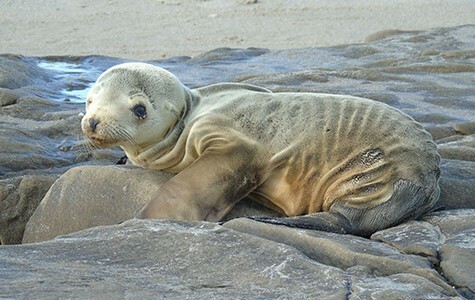 In Southern and Central California, nearly 2,000 California sea lion pups have struggled ashore this winter, starving and lost because the ocean has been unable to provide enough calories for their mothers to adequately feed them. The young sea lions have inundated rescue centers, and those working at the facilities, who saw similar events in 2014 and in 2013, have become all too familiar with the sight of emaciated, bawling pups. According to the National Oceanic and Atmospheric Administration, between 100 and 300 sea lion pups have been delivered to rescue centers in California nearly every winter and spring since 2004. But in recent years, the ocean has been particularly inhospitable for the hefty marine mammals. In 2013, 1,171 pups were rescued from California beaches, and in 2014, 621 were. This year, as of March 8, 1,600 live sea lion pups had been discovered on the shore and brought to rescue centers, including the Marine Mammal Center in the Marin Headlands. These figures do not include sea lion pups found dead. The reason why baby sea lions — most of which are born at the Channel Islands off the coast of Santa Barbara — are starving is not a mystery. The coastal population of sardines, a major food source for sea lion mothers, has plunged in the past eight years. Additionally, in the current season, sardines have moved far offshore, and so this winter mother sea lions have been hard-pressed to find enough to eat and also nurse their hungry pups. The sardine decline has pitted environmentalists against fishermen. The conservation group Oceana argues that commercial fishermen are taking too many sardines. Ben Enticknap, a senior scientist with Oceana, said sardine numbers routinely swing up and down based on ocean cycles and seasonal productivity. Wind-driven upwelling, for instance, generates plankton blooms, which, in turn, provide nourishment for schooling bait fishes. "But fishing is making it worse," he said. Oceana has been pushing for a complete closure of the sardine fishery for several years, since the population began slipping noticeably in 2007. Enticknap said the one hundred-plus boats that wrap floating nets called purse seines around shoals of sardines, collectively landing tens of thousands of tons every year, are essentially stealing the food from the mouths of sea lions and other creatures that subsist on small fish. Moreover, most of the sardine catch is exported, and most is not eaten directly by people. The fish are rendered into animal feed for zoos, used as bait by tuna fishermen, and sold to Japanese and Australian aquaculture facilities, where tuna reared in floating pens are fattened on the six-inch feed fish. It generally takes about twenty pounds of small fish to produce one pound of saleable tuna. Enticknap said Americans are in essence trading away one perfectly good food source for relatively small returns on another. But, according to the sardine fishing industry, blaming overfishing for the sea lion collapse is a stretch. Diane Pleschner-Steele, director of the California Wetfish Producers Association, argued that the West Coast sardine fishery is one of the most conservatively managed in the world, with regulatory triggers already in place that shut down the fishery if estimated sardine numbers dip below a critical point. "If the fishery does close this year, Oceana is going to say they got it done, but it would have closed anyway," Pleschner-Steele said. "We have these regulations already." Preliminary calculations this year from National Marine Fisheries Service scientists, who use sonar to measure the density of sardine schools, put the total West Coast biomass at around 165,000 tons. That may sound like a monumental amount of small fish in the waters off of California, Oregon and Washington, but it's just a fraction of sardines' historic numbers. During the late 1990s and early Aughts, there may have been more than 1.5 million tons of sardines seething in West Coast waters. Earlier still, prior to the 1940s sardine fishery collapse and the long industry shutdown that followed, there may have been more than 3 million tons. "Certainly, overfishing took place in the 1940s," Pleschner-Steele said. Seventy years ago, fishermen regularly caught half of the total sardine biomass each year. But today, catch limits keep fishermen from taking more than 5 to 15 percent. In 2013, the sardine biomass was estimated to be about 725,000 tons, and so fishermen were allowed a catch of 60,000 tons. In 2014, with the sardine stock down to 406,000 tons, the catch limit was cut to 21,000 tons. Pleschner-Steele contends that the sardine fishery, with its tight catch limits, is "the poster child of sustainable ecosystem management." But there is no doubt that the population is severely depressed. In fact, if the current biomass estimate is accurate, then sardines have declined to their lowest level in six decades. And while it's unclear whether fishing is a significant cause for the collapse, the fishery must be restricted or closed, said Sheila Bowman of the Monterey Bay Aquarium's Seafood Watch Program. "Unfortunately, [closing the fishery] directly impacts the fishermen who may not have been the cause of the decrease," Bowman said. "However, until the circumstances can be better understood, this is the most effective tool in a fishery managers' toolbox." Scientists believe that environmental conditions related to global wind and current patterns have the biggest impact on sardine populations. Core samples from the Southern California seafloor have shown that fish scale density ranges up and down through the strata, indicating huge population swings in anchovy and sardine numbers every few decades — centuries before commercial fishing began. And for sea lions, a shortage of sardines doesn't always mean death. The animals are opportunistic and will feed on a broad menu of marine species, including squid, hake, and rockfish. However, these low-fat food items may lack the nutritional profile needed by lactating mother sea lions. Sharon Melin, a wildlife biologist with the National Oceanic and Atmospheric Association, said a mother sea lion will spend several days at sea feeding before returning to the rookery to nurse her pup. But when oily species like anchovies, sardines, and herring are in short supply, the adult may spend more time at sea, searching for food. If the pups grow too hungry in their mothers' absence, they may enter the sea themselves and try their hand at hunting. For animals just a month or two old, this usually doesn't work very well. "They just aren't ready — they aren't fast enough; they aren't strong enough," Melin explained. "So they wash up onshore." Melin said the California sea lion population has boomed from roughly 50,000 in the 1970s to more than 300,000 today. This, she says, combined with depressed food supplies, is the explanation for recent starvation events. "This is basically the environment and its resources checking the population growth," she said. But Oceana representatives are resolute in their belief that there is a strong link between sardine fishing and sea lion starvation, and they've been trying for years to close the fishery if the biomass dips below 704,000 tons — which would be almost five times higher than the existing rules. But the fishery's regulations are already conservative enough, according to Pleschner-Steele. "Oceana's recommendation is ridiculous," she said. "That would allow for no industry, and it's totally unnecessary."